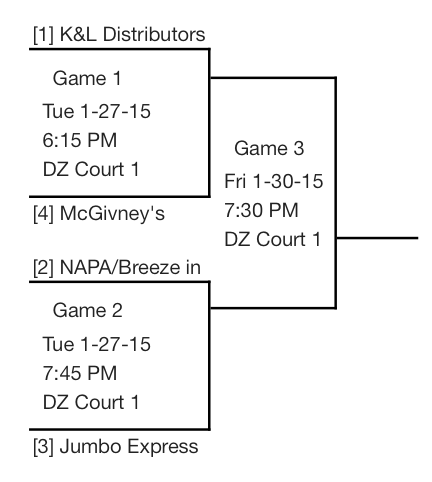 Playoff action began on Sunday January 25th with the opening rounds of the 6 team playoff brackets for Men’s Division 3 and Women’s Division 2, as well as the 4 team brackets for Men’s Division 1 and Women’s Division 1. 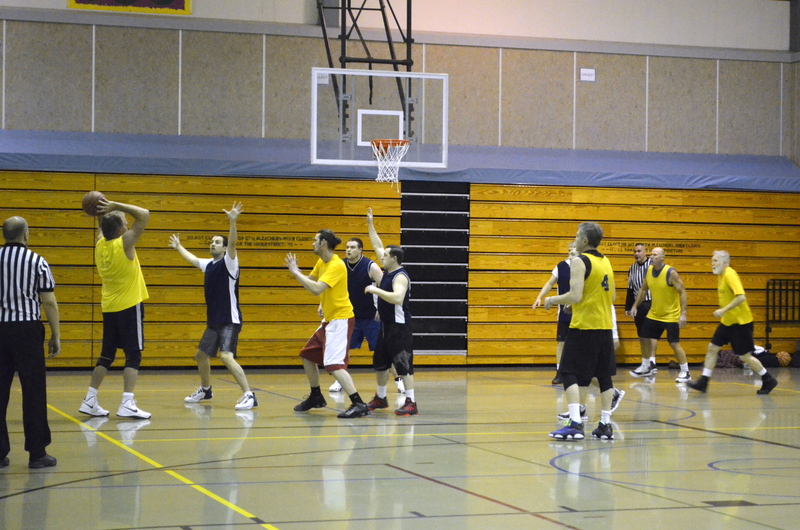 We had some great close games all day, 4 of the 7 games were decided by 5 points or less – including a 4 point overtime victory by JP Construction in Men’s Division 1 to finish off the night. 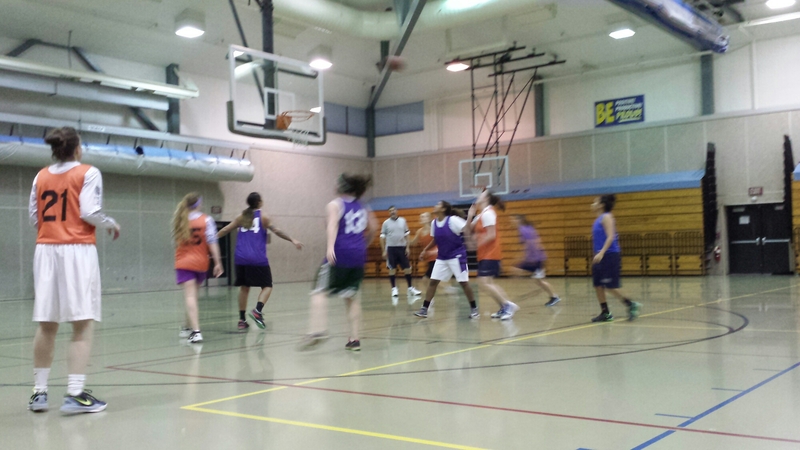 Tonight will be the semi-final games for Men’s Division 3, Women’s Division 2, and Men’s Division 2. 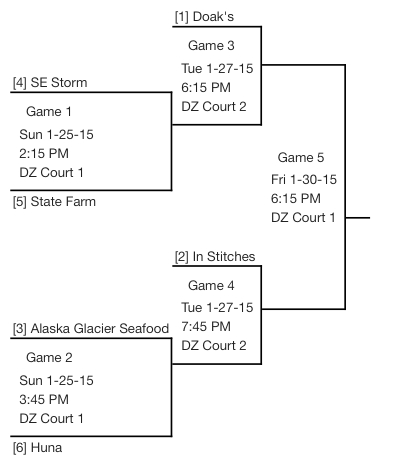 While the Men’s and Women’s Division 1 Championship games will be on Wednesday. 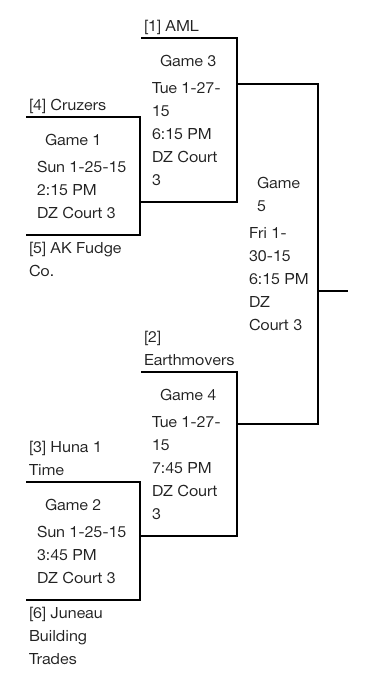 6:15pm Court 3 – #1 AML vs. #5 AK Fudge Co. Schedules & Rosters Available Online! All of the Team Pages (listed under the ‘City League’ tab) are officially up to date with rosters and schedules. We’ll use these pages to add a team photo and stats as the season progresses. Rosters will be updated daily as players continue to trickle in those registrations. Please remember that players need to be registered and paid for online by 4pm one day prior to their first eligible game. Scorekeepers will already have official rosters on hand for each game, no changes or write-ins will be allowed at game time. Special thanks to all the managers and scorekeepers and refs that showed up to the meetings today. If your team was eligible for the Win, this will be reflected in the standings at the end of the season. We’re really looking to improve this league for everyone involved, including the community, so thank you for all your support so far.